Old Macdonald has a fine collection of tortoises here at your favourite farm, but was sad to learn of the loss of Lonesome George in the Galapagos Islands, the last of his sub species. He found this fascinating article on the BBC website and wanted to share it. 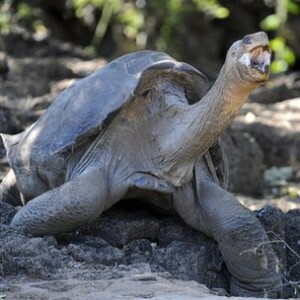 Lonesome George, the last Pinta giant tortoise has died and his kind is now extinct. But if his genes live on in tortoise “relatives”, how much does the loss of this subspecies matter? “Usually we don’t notice it. “It happens, then we discover it, but it’s too late then,” says Lonesome George expert Dr Henry Nicholls about the moment of extinction, something humanity almost never knowingly sees. But for the last Pinta Island giant tortoise, named in the Guinness Book of World Records as the world’s rarest animal, it was different. “George managed to string out a moment of extinction for 40 years in captivity,” says Dr Nicholls, who wrote Lonesome George: The Life and Loves of a Conservation Icon. “More than just a symbol for the Galapagos, Lonesome George was a symbol of our global never-ending struggle to preserve the richness and diversity and beauty of the planet we inherited,” an open letter published by the International Union for Conservation of Nature (IUCN) says. But a series of genetic discoveries in recent years at Volcano Wolf on Isabela, one of the Galapagos Islands, offers some consolation. 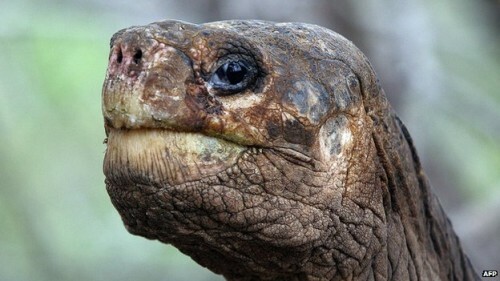 Scientists from Yale found a first generation hybrid of the Pinta giant tortoises and Isabela tortoises, meaning that 50% of Lonesome George’s genetic material is still around, along with other strands of the genetic ancestry that Galapagos giant tortoises share. “Even though Lonesome George and his lineage are gone there are still a couple of animals up on Volcano Wolf where they carry essentially the genetic make-up that is related to George, so some of the relatives are still around,” says Dr Peter Paul Van Dijk, co-chair of the IUCN specialist group for tortoises and freshwater turtles. The movement of tortoises between the islands by boat is thought to be behind the mixing of genes. How much solace can be found in the presence of some of Lonesome George’s genes in other subspecies of Galapagos giant tortoises, depends on how subspecies are viewed. The definitions of subspecies and species are based on scientific principles of categorisation and are hotly debated. From an evolutionary point of view, subspecies are on their way to becoming species, having moved in a different evolutionary direction from other subspecies that hold a common genetic ancestry. The tortoises of the Galapagos are an example, says Dr Peter Paul Van Dijk. “Obviously the Galapagos are a volcanic chain of islands. “They are arising anew from the sea floor, so somewhere between the geological point of formation of individual Galapagos islands and now, the tortoise population colonised that newly formed island. “That is essentially when the clock starts ticking on developing a new form, a new evolutionary lineage,” he says. Whether the tortoises that evolved on each island are called subspecies or species does not really matter that much. But what is lost when one of the forms disappears is an entire history of cohabitation. Some of the world’s most iconic conservation efforts are actually focused on animals that are usually held to be subspecies rather than species. For example, there is only one species of tiger, Panthera tigris but many tiger subspecies are threatened. 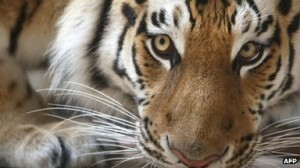 The Amur tiger, South China tiger, Indochinese tiger, Malayan tiger, Sumatran tiger and Bengal tiger are all subspecies on the IUCN’s Red List of threatened species. “Subspecies are morphologically different, in coat patterns, in size, in morphological features because they adapted to their region,” says Dr Christine Breitenmoser, co-chair of the IUCN cat specialist group. “They were all under different conditions, grew up with different competitors, there were other carnivores around, so it all has an influence on the evolution of the species,” she says. But when a species or subspecies is lost, the fact that it has genetically similar forms in existence means that some form of reintroduction into the ecosystem may be possible under some circumstances. The Pinta giant tortoise was similar to the subspecies from nearby Espanola Island, says Dr Nicholls. “In a way putting new ones on there is like re-setting that clock and obviously that’s going to take a long time and evolution will unfold in a totally different way. “Another 200,000 years from now will not give you Pinta tortoises again. The genes will be drifting in different ways. “I don’t suppose they (the Pinta giant tortoises) are very different at all from the Espanola ones… the Espanola ones that are there now pretty much will do exactly the same thing,” he says. So is the loss of subspecies with relatively short evolutionary histories, such as Lonesome George’s subspecies, more disastrous for conservation from a symbolic point of view than it is from an evolutionary perspective? There are some attempts to take evolutionary history into account when sorting conservation priorities. The Evolutionarily Distinct Globally Endangered (Edge) programme at the Zoological Society of London is working on a way to combine evolutionary history in order to build on existing endangered species lists. “We work out how much unique evolutionary history each species represent by essentially taking a family tree, a phylogenetic super tree for a particular group of species,” says Carly Waterman, programme manager at Edge. Those species that evolved relatively recently will get lower ED scores. That is then combined with a score based on the IUCN red list of endangered species, to sort species into a top 100 highest-scoring Edge species. “We’re highlighting the 100 highest-scoring Edge species on our website. For the mammals… 66% of the species on this list are receiving little or no conservation attention,” she says. While elephants, rhinos and pandas are all named as Edge species, so are some lesser-known animals such as the Hispaniolan solenodon and the long-beaked echidna. On the amphibians list, the top 100 includes purple frogs and Chinese salamanders. “It’s been a real challenge for us to try to get people to care about these species that they didn’t even know existed in the first place,” says Carly Waterman. But “we’re in no way saying Edge species are more important than other species”, she says. But there are reasons to remain optimistic, says Dr Peter Paul Van Dijk. The surviving genetic material that is shared with Lonesome George and other Galapagos giant tortoises may present fresh opportunities for conservation. “We have a whole new window opening up on potential recovery for some of these lineages deemed extinct. We are trying to figure out what the implications and possibilities and opportunities are,” he says.